Oklahoma’s U.S. Sen. Jim Inhofe is leading the xenophobic charge again to make English the official language of the United States. 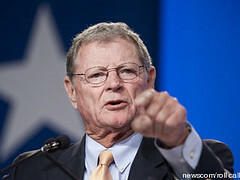 Under legislation proposed by Inhofe in the Senate, all the government’s “official duties” must be in English and it also “requires the Secretary of Homeland Security to propose a policy for English language testing during the naturalization process,” according to a press release on the senator’s website. Iowa’s U.S. Rep. Steve King introduced companion legislation in the House. Both Inhofe and King disingenuously stress the legislation is about “commonality” and “common language” without acknowledging its punitive nature and its attack, in particular, on the Hispanic community. There are approximately 48.4 million Hispanic and Latino Americans in the country. This legislation will provide much-needed commonality among United States citizens, regardless of heritage. As a nation built by immigrants, it is important that we share one vision and one official language. A common language is the most powerful unifying force known throughout history. We need to encourage assimilation of all legal immigrants in each generation. A nation divided by language cannot pull together as effectively as a people. Note Inhofe’s statement that we should “share one vision and one official language.” What exactly does he mean by “one vision”? Is that even possible in a Democracy? What type of person wants only “one vision” for a country the size of the United States? Of course, Inhofe can argue he’s just promoting the views of his constituency. Oklahoma voters overwhelmingly passed its own English-only measure last November by a 75 to 25 percent margin. A lawsuit was filed challenging the constitutionality of the measure after the vote. The English-only movement is primarily driven by social conservatives and seems particularly targeted, along with anti-illegal immigration legislation, at the Hispanic community. But what about promoting language acquisition at all levels? Shouldn’t we promote the idea that Americans should try to know other languages as well as English? Isn’t that a more enlightened view than “one vision” for the entire country? Meanwhile, another anti-illegal immigration bill is making its way through the Oklahoma legislature. Some of its requirements are at least somewhat based on the controversial and recently passed Arizona law, which included giving police more power to determine if someone is here legally. Gov. Mary Fallin should veto the bill if it gets final legislative approval, but will she worry about alienating her base? In the end, English-only and even stricter anti-illegal immigration laws here make the state seem intolerant of people from other cultures. This is not good for the state’s business climate or its intellectual community. Obviously, Inhofe is playing to the base here with his legislation. Unfortunately, while the corporate media-The Oklahoman and the Tulsa World, in particular-opposed Oklahoma’s English-only measure, it also implicitly condones and enables Inhofe’s overall political agenda by supporting him for office.